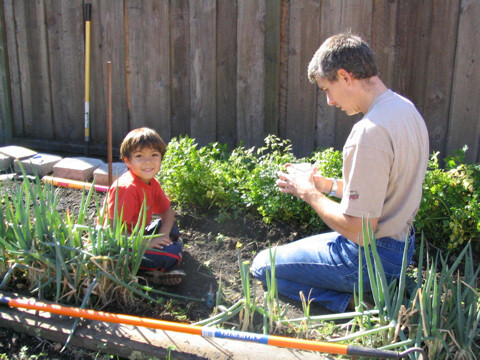 Make veggie gardening with your kids a goal for 2009! Vegetable gardening has been a part of my life every year minus a few years when I was lookin’ for Mrs. Right (and luckily found someone who also loved garden-grown veggies!) Every January, I start thinking of what I will grow or try differently for the gardening year ahead, so each year ends up with a theme. Planning for 2009 got us thinking that it is not just about our garden any longer. It is much bigger this year. It is not what is happening in our backyard, but in backyards across the nation. The bleak economic outlook is motivating people to find ways to save money. 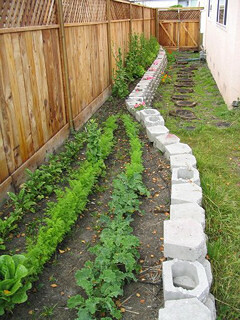 There is a movement to convert manicured front lawns into vegetable gardens. Produce and food supply scares in the past decade are making us think about safety and where we want to source food. There are people petitioning to have the US White House start a vegetable garden. There has been an explosion of gardening conversations on Twitter. It is now “hip” to be square … a square-foot gardener! The world is buzzing with “green” initiatives. People want to buy everything from apples to zucchini with an “organic” label. People are starting to walk the walk on “food miles“. OK, so there’s no hard data backing up my predictions. Call it conjecture from someone who has been a keen observer, but I’m excited about the prospects of more veggie gardens appearing on the planet. So this year’s “theme” will be helping and interacting with more novice-to-experienced vegetable gardeners in getting the most out of their gardening endeavors! Please feel free to email me with questions, stalk me on Twitter or submit a question/post on our Plangarden forum.